The Parker Solar Probe will experience forces and torques as it passes within about 8.5 solar radii of the Sun's surface that even a General Products hull will not protect it from. 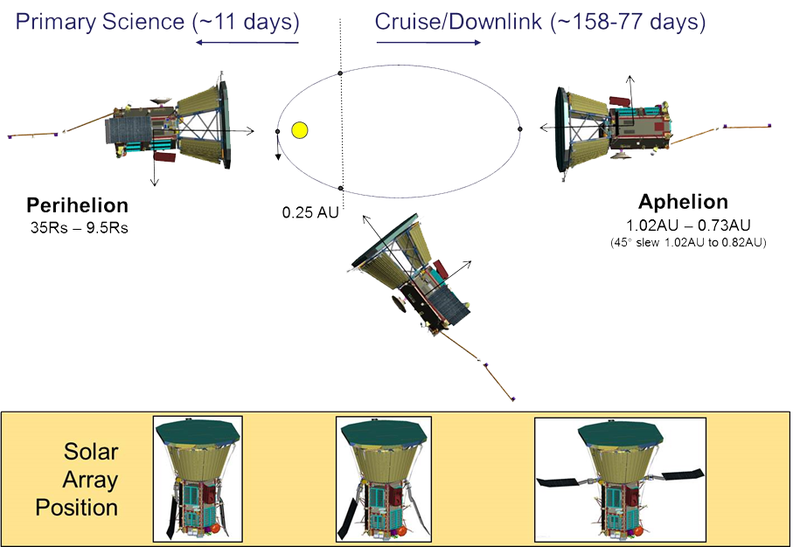 How large will the tidal acceleration be along the 3 meter length of the spacecraft at perihelion? Will it be detectable in any way? Will there be any (real or effective) torques that will tend to rotate the spacecraft during it's closest flybys? What about effects due to the oblates of the sun? Will any of these be a new record - or have Cassini or Juno experienced greater effects during their closes approaches to Saturn and Jupiter already? above: Parker Solar Probe cropped, from here. 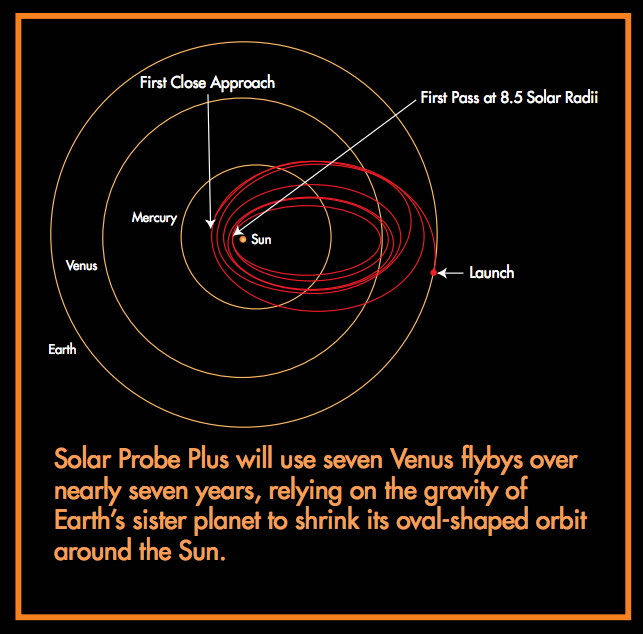 above: Illustration of Parker Solar Probe's orbit, from here. 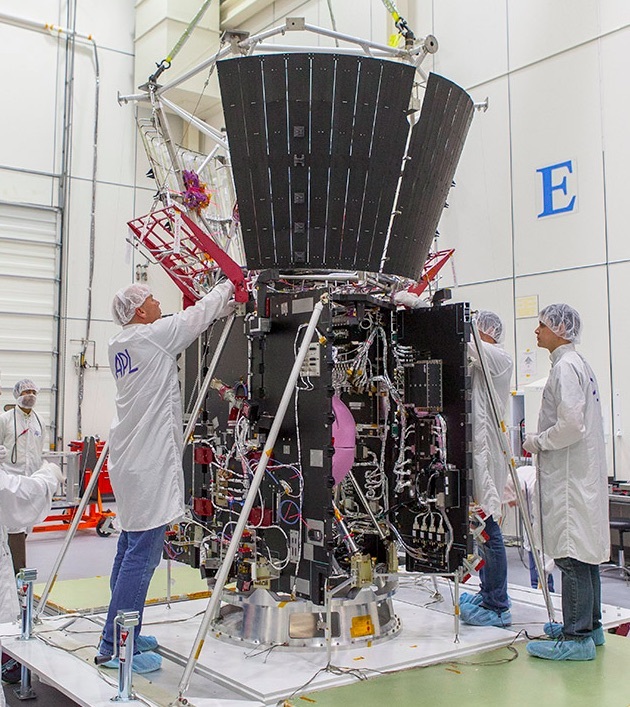 The largest torque affecting the Parker Solar Probe during its closest approach is caused by the solar wind blasting against the heat shield (Thermal Protection System, a.k.a TPS). The TPS is like an umbrella held facing into a strong wind. The wind whips against it, and tries to force it around away from the wind. The spacecraft has to "fight" against this force to maintain it's proper attitude with the TPS pointed right at the sun and right into the solar wind. To "fight" against the solar wind, the primary mechanism is the spacecraft's reaction wheels. They are mounted at angles to each other (there are four) and they are spun up or slowed down to create the counter force to the solar wind acting on the TPS. The spacecraft subsystem that controls the wheels is the Guidance and Control (G&C) system. Fifty times a second (50 Hz) the inertial measurement unit provides change-in-attitude readings and the G&C system calculates the reaction wheel response required to counter act the change and bring the spacecraft back to the correct attitude with the TPS pointing at the sun. In addition to controlling attitude with the reaction wheels, the spacecraft thrusters can also be used, but this is not normally done because it degrades the science measurements. However, as the reaction wheels counter the torques from the solar wind, they wind up and spin faster and faster. In order to bring the speed back down, the spacecraft periodically performs a "monmentum dump" by firing the thrusters to counter-act the wheel's momentum and allow them to slow down to a manageable rate. Not the answer you're looking for? Browse other questions tagged solar-probe parker-solar-probe or ask your own question.